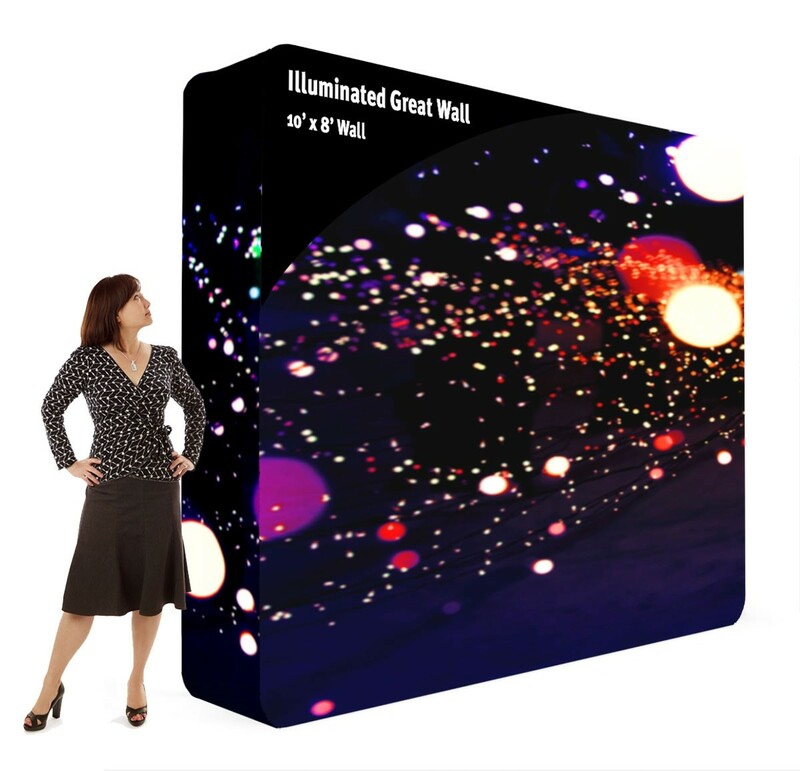 Illuminated Great Wall fabric displays are extra wide aluminum tube frames covered in zippered pillowcase stretch fabric graphics with internal LED lighting. 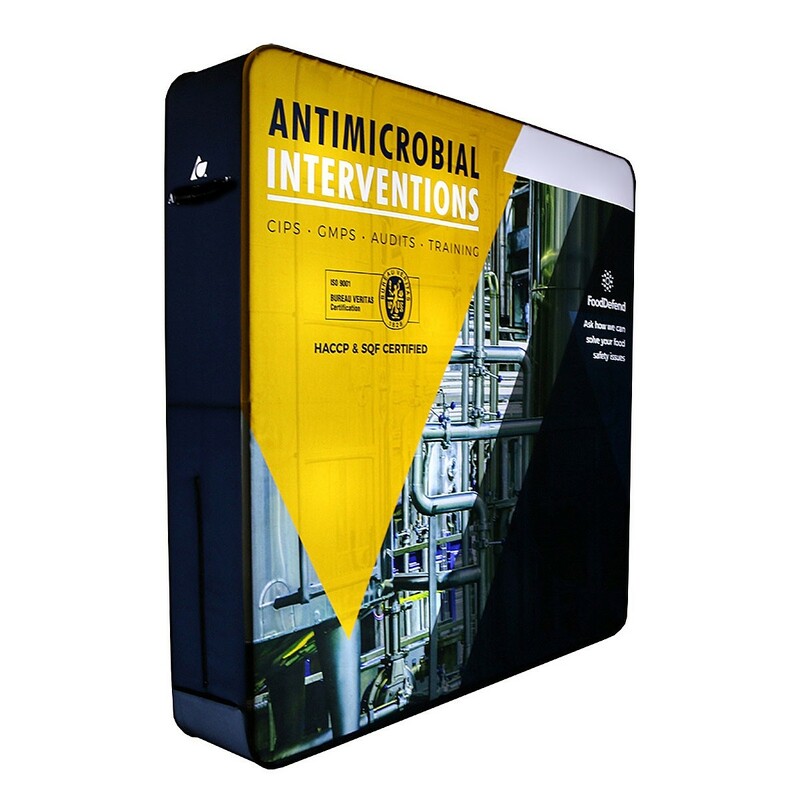 The Illuminated Great Wall 10x8 tension fabric display has a total front graphic area of 120" x 96". Illuminated Great Wall fabric displays are extra wide aluminum tube frames covered in zippered pillowcase stretch fabric graphics with internal LED lighting. 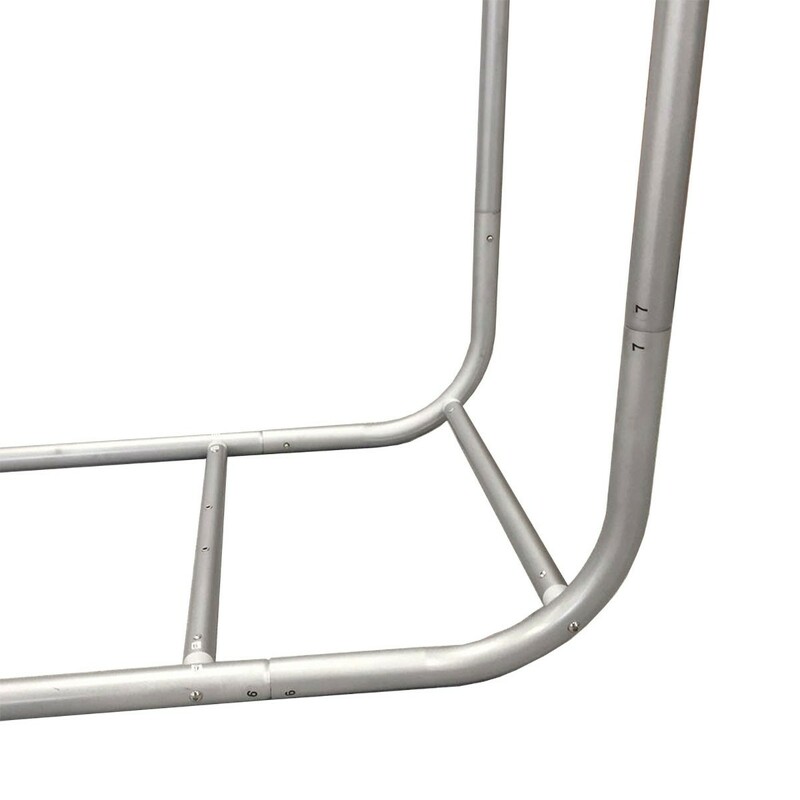 The 20" deep frame is very stable and gives a more substantial look. This also provides space on the sides for additional messaging, like the end caps on pop up displays, which are typically missing from pillowcase fabric displays. The deep frame also gives more space for the LED lighting to spread which makes the lighting more uniform than most LED backlit displays. The down side is that because the light source is further from the graphic, it doesn't look as bright as some of the other backlit fabric displays. The Illuminated Great Wall actually has more lumens of light output than any other display to help compensate for this, but it will still appear to be less bright, but more more evenly lit, than the alternatives. 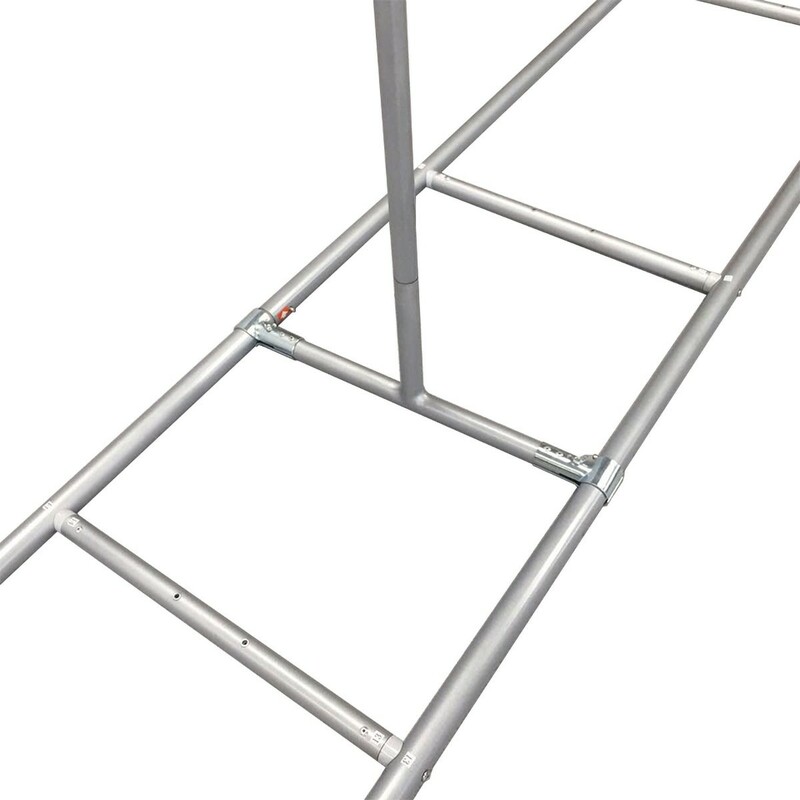 Available in a range of sizes up to 20' wide. Graphic options are available with just the front and sides custom printed, and a blank back face for single sided use, or with a custom printed back face for double sided use. The stretch fabric zippered pillowcase graphics are dye-sublimated using the latest printing technology to provide rich, vibrant color images that are durable and can be dry cleaned. These graphics are printed and hand-sewn in-house to ensure the highest quality and proper fit. 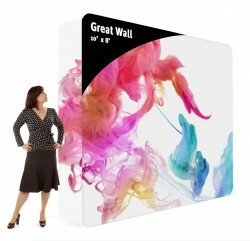 The Illuminated Great Wall 10x8 tension fabric display has a total front graphic area of 120" x 96". It comes complete with the frame, LED lighting, zippered pillowcase stretch fabric graphic, and canvas carry bag. The Vector Frame Backlit fabric display would be considered a higher-end model, but it's also a different style of display with SEG graphics. With the lights being very close to the graphic, it offers brighter illumination with less light output. This style of display does not allow for end caps. The Illuminated Great Wall is our least expensive backlit trade show display. 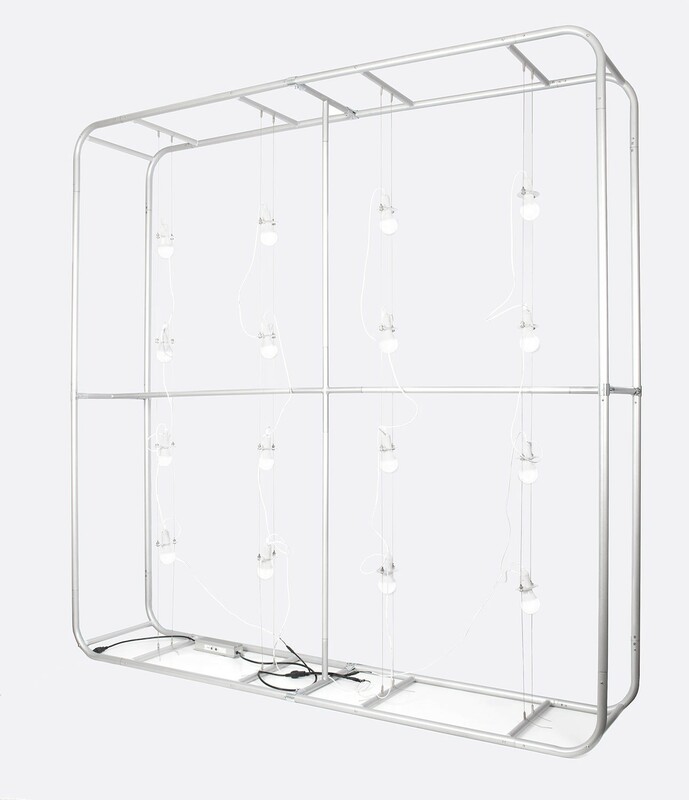 The Expandable Shipping Case is the recommended shipping case for this display. It can be ordered from the Related Products tab. Front Graphic size: 120" x 96"
Side Panel Graphic size: 20.75" x 84"
LED Bulb Specs: Each bulb is a low voltage 9W LED with 820 lumens with a 6000K color temperature. There are 4 bulbs for each 2' of the display width. Shipping size: 54" x 22" x 10"